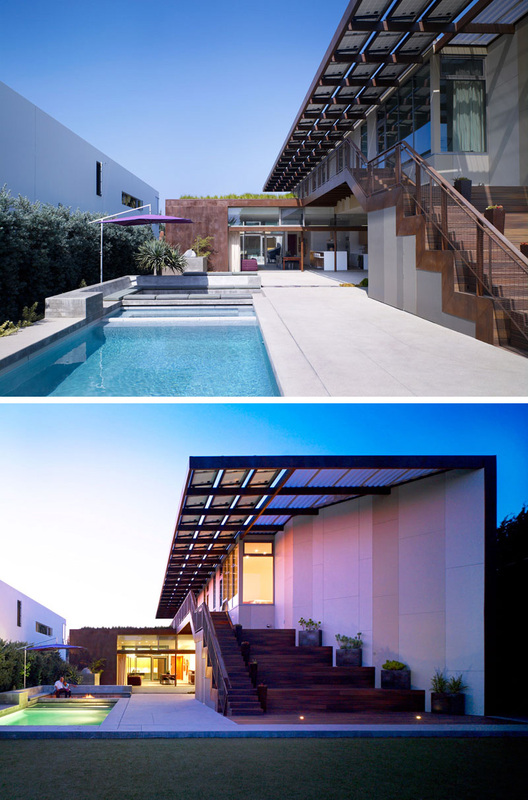 Architecture firm Brooks + Scarpa, designed the Yin-Yang house, a modern net-zero energy family home in Venice, California. The front of the house appears to have a solid lower level until the garage door is activated, then it folds out and up to reveal the contents inside. A balcony on the second floor makes it easy to see what’s happening on the street. At the rear of the house, a large concrete patio is revealed with a 40 foot long glass sliding door that leads to the inside of the house. Stepping into the living room, purple sofas have been paired with lime green cushions and wooden coffee tables. 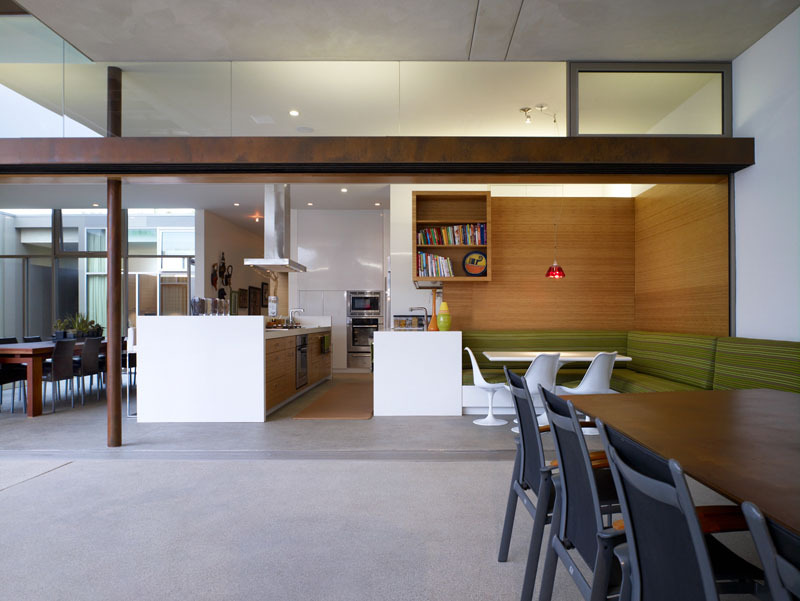 A large wood dining table separates the living room from the kitchen. 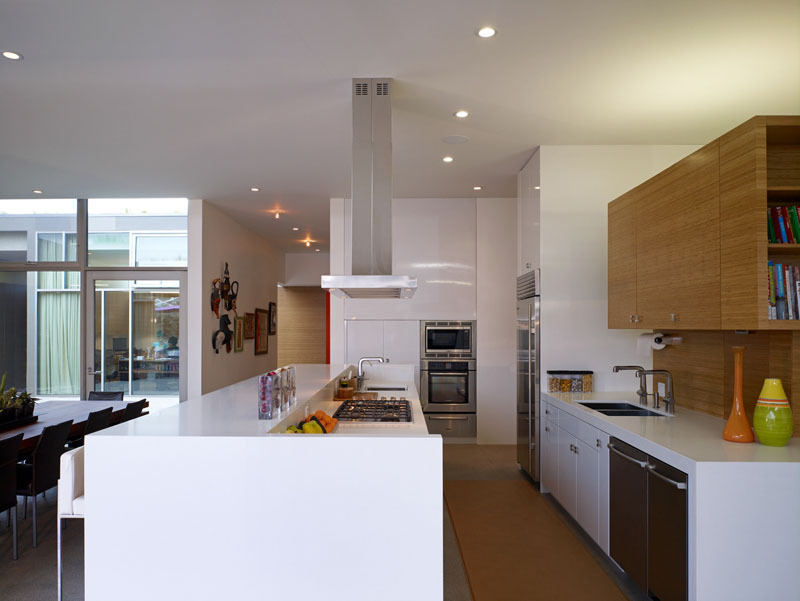 In the kitchen, a long white island is combined with wood cabinetry to provide a contemporary look. Off to the side of the kitchen is a built-in dining nook. The banquette seating continues through to the outside, with the seating only separated when the sliding glass door is closed. Further seating has been built-in near the pool, and helps to create the perfect place to relax in the backyard. The pool lights up when it becomes dark making it safe to swim even at night. Off to the side of the pool are a set of exterior wood stairs that lead to the upper floor of the house. A sturdy metal railing keeps the stairs safe. 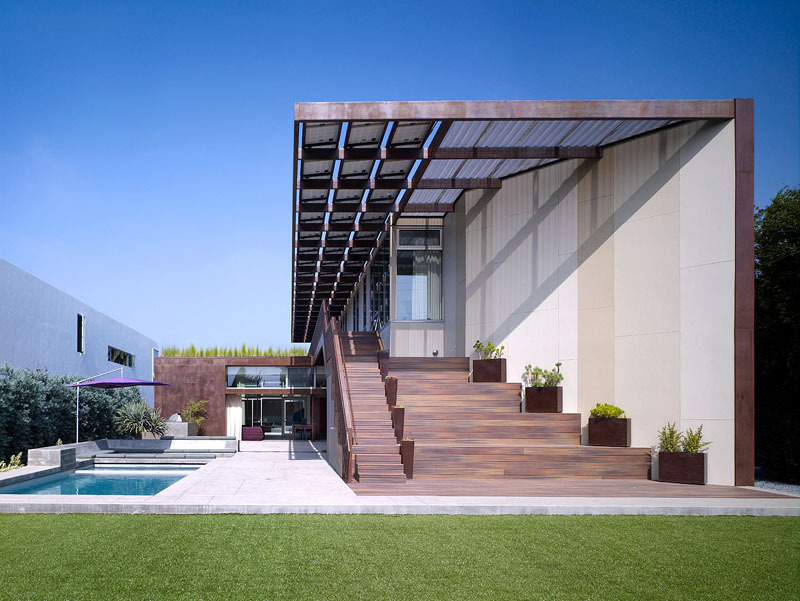 The stairs also double as an additional place to sit in the backyard. 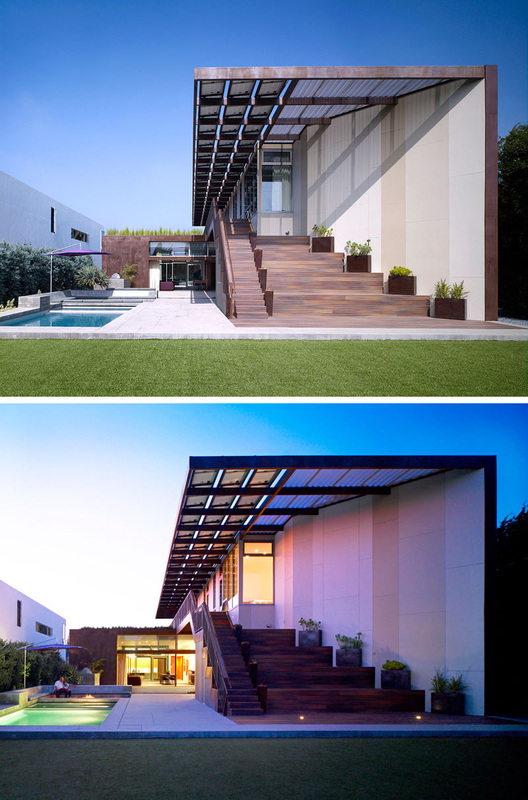 The overhanging roof has solar panels and extends out over the stairs providing shade from the sun. 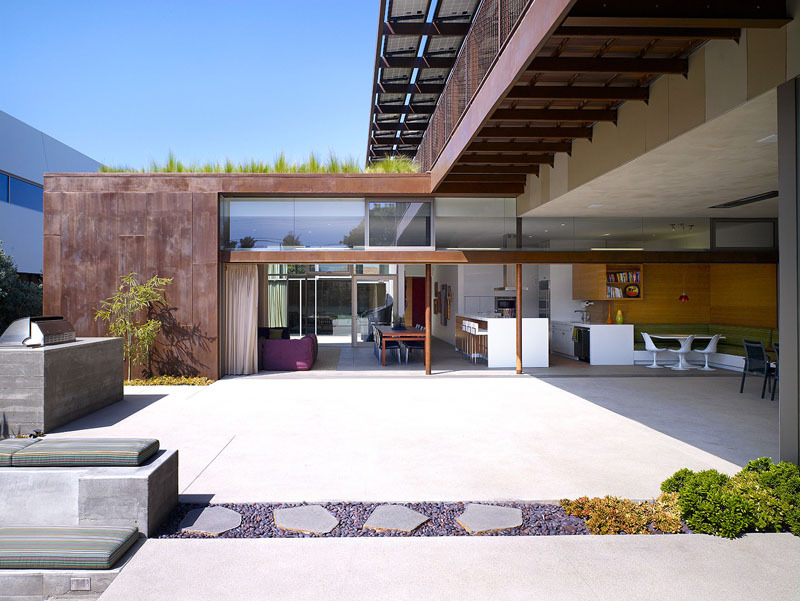 A long exterior walkway appears at the top of the house, leading to the bedrooms. 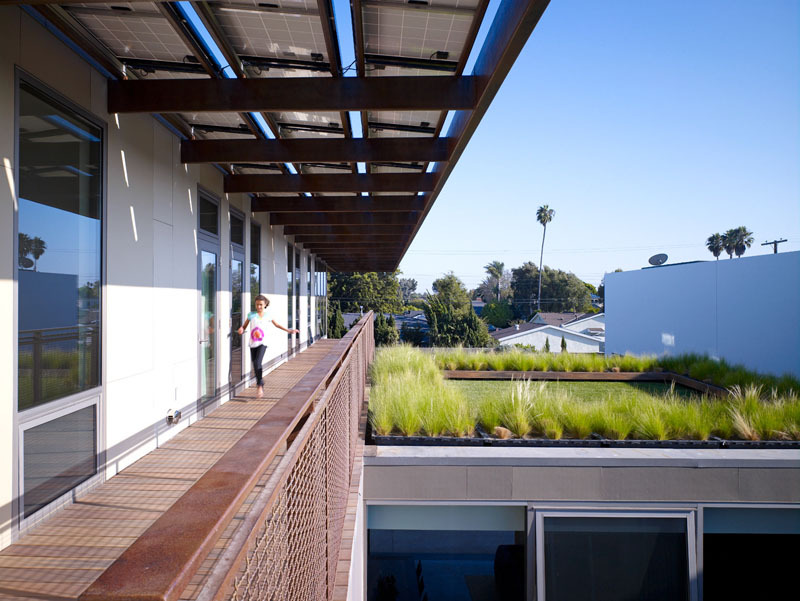 A green roof has been added above the living room to provide environmental benefits. 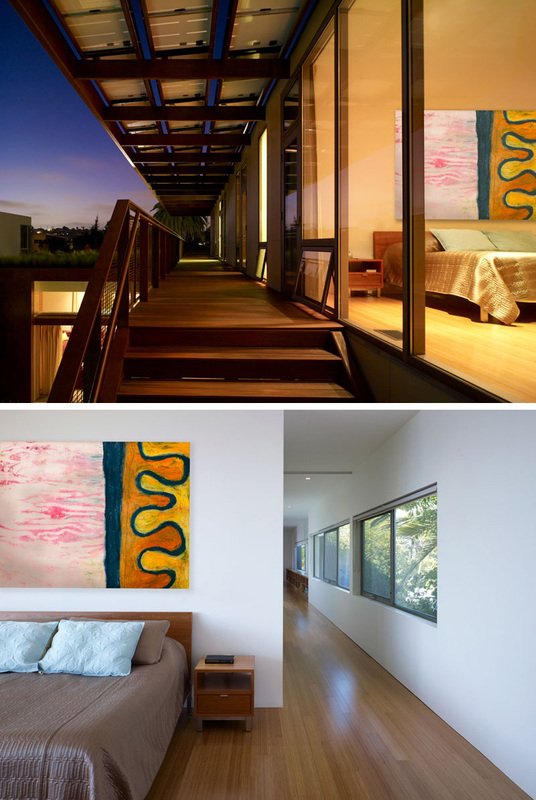 The wood walkway provides access to the bedrooms on the upper floor of the home.